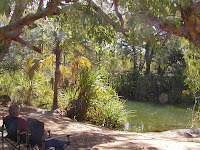 Carisbrooke Station, Cloncurry, Gregory River, Lawn Hill, Kingfisher Camping Ground. Over the last ten days we have travelled to Carisbrooke Station, Cloncurry, GregoryRiver, Lawn Hill and we have arrived at Kingfisher Camping Ground. The road from Emerald was boring, but from Long Reach to Carisbrooke Station parts of the terrain improved.Brigaloe? Bush, Grevilleas, Wattles, Eucalypts, Banksias and Mitchell Grass made the trip interesting, although dry, flat plains and there wasvbulldust for long sections of the road.Daily we have been travelling between 350-450kms. Carisbrooke Station was once a sheep station and we camped at the shearing sheds. Nowadays, all they run are 1200 head of cattle. A day trip from there was to Lark’s Quarry, only to find we had missed the last tour, but after another couple arrived, the Ranger took pity on us all and went ahead with the tour of the fossils some 3000 Dinosaur tracks, now completely enclosed by an eco-architecturally designed building to keep the fossils at 16 degrees. 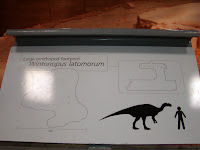 The fossils showed the smaller Coelurosaurs and Ornithipods were drinking at the waterhole (95 million years ago), when a huge Theropod came down to drink also. Realising his luck, the footprints show him making chase. 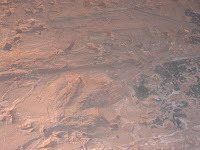 Run-off from heavy rains caused the lake to rise, and a fresh layer of silt covered the mudflat where the stampede occurred, preserving the footprints for aeons to come. 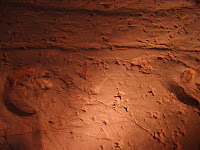 The footprints were in clay and filled with silt, and over many years iron oxide filtered through and made a deposit between the iron and the silt. Larks Quarry Conservation Park is 110kms SW from Winton. Travelling to Cloncurry, we were covering the same boring plains, until we came across Combo Waterhole on the Diamantina, the site that inspired Banjo Paterson to write Waltzing Matilda – beautiful place, with Coolibah trees, but unfortunately it had been taken over by one family camping there, although no camping was allowed. The terrain improved approximately 50 kms from Cloncurry, with green tufts of grass, a large variety of small trees and the presence of many more water courses (although mostly dry), crossing the highway. We had a good stop at Cloncurry and have clocked up 5000 kms. Arrived at Gregory Downs at 12pm and went to the one of two buildings in town – the Pub, where we had lunch. On route, the owner of the Burke and Wills roadhouse told us about a camping spot on the Gregory River, which we found and it was breathtaking. Most people camp under the bridge at Gregory Downs, but this campsite was down a little 4WD track. The caravan handled it perfectly and we were right on the river, amongst Mask Finches, Cicada Birds, Swamp Harriers, Petite Willy Wagtails and Crimson Finches. It reminded us of the waterholes at Kakadu, although a much smaller scale.